Archdiocese of Wellington – Mary and the Reformation, 2: Zwingli Pt 1. Home » Wel-com » Mary and the Reformation, 2: Zwingli Pt 1. Mary and the Reformation, 2: Zwingli Pt 1. This year marks the 500th anniversary of the Protestant Reformation, which brought the Catholic Church into deep conflict and schisms. Kieran Fenn fms continues his series on Mary and the Reformation in which he explores some of the key reformers of the sixteenth century. This is the first part about Ulrich Zwingli. Huldrych Zwingli (1531), oil portrait by Hans Asper, Kunstmuseum Winterthur. 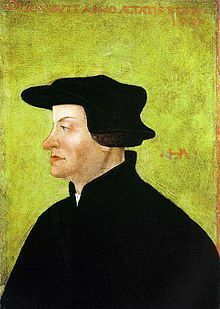 Pastor and theologian Huldrych Zwingli or Ulrich Zwingli (1484–1531) was a leader of the Reformation in Switzerland. He attended the University of Vienna and the University of Basel and continued his studies while he served as a pastor in Glarus and later in Einsiedeln, where he was influenced by the writings of Erasmus. In 1519, Zwingli became the pastor of the Grossmünster in Zurich where he began to preach ideas on reform of the Catholic Church. In 1522, he attacked the custom of fasting during Lent. He noted corruption in the ecclesiastical hierarchy, promoted clerical marriage, and attacked the use of images in places of worship. In 1525, Zwingli introduced a new communion liturgy to replace the Mass. To mark the 500th anniversary of the Reformation it is important to consider one of its most important controversies – that which swirled around the figure of Mary. It does no good to evade the catastrophic decline in church discipline and theological teaching in the Catholicism of the fifteenth century and the papacies of Julius II whose main concern was to reinforce the political power of the papacy and Leo X who behaved like a Renaissance prince. Neither was concerned with moral and theological reform. From 1516 to 1518 when Zwingli was chaplain at the monastery of Einsiedeln, his main task was to preach to pilgrims honouring a famous statue of the Virgin. He had many occasions to speak of Mary, preaching on the Annunciation and on her presence at Pentecost. He often referred to Mary when commenting on the Bible and spoke eloquently about her. Not only was he the first of the major Reformers, he was the most Marian figure of the Reformation. 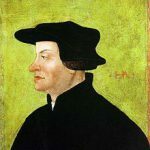 In the family of Jesus Zwingli did not forget Joseph. In a sermon on Mary he begins with praise of the man to whom she was betrothed and then married. In this man ‘the divine wisdom’ was manifested. For if Joseph had not been there Mary would have been stoned according to Jewish Law. ‘He protected her from the Law’. He helped her flight into Egypt and in their return to Judea and Galilee, and his service was ‘most welcome to her’. In 1522 Zwingli was the priest in charge of the Gross Munster of Zurich, the main church of the city. He wrote to his family, ‘If you are told that I despise God and his Mother, or that I falsify God’s teaching, do not believe it.’ He assumed that good Christians are in the habit of reciting the Hail Mary, but knew only the scriptural first half, not the later addition popularised between 1555 and 1566. He realised the starting point for correct teaching about Mary is the Christological role of mother of Christ as implied in her traditional title Theotokos or God-bearer, for which she should be praised, ‘the ever-pure Maid who has born this Saviour for us.’ It is right and proper to praise her, he taught, but not to invoke her or pray to her. It was at this point that Zwingli rejected the prayers of petition that were commonly addressed in Catholic piety to the Mother of God and the saints, not admitting invocations of Mary that ask for her intercession or mediation. But he accepted a contemplative evocation and praise of her, insisting the Hail Mary (as known then) was ‘not a prayer, but a greeting and a praise’, scriptural since it repeats the greetings of the archangel Gabriel at the Annunciation and the praise of Elizabeth at the Visitation. Prayer in German means: ‘To ask to bring something, to beg for a gift, but the Hail Mary does not ask for anything. It is pure greeting and praise, mirroring Mary’s own Magnificat, ‘The Almighty has done great things for me.’ Zwingli acknowledged the fundamental title of Theotokos: Mary’s motherhood of the divine Word as the basis for her praise, even affirming, She remained a pure, unsullied Virgin before the birth, in and after the birth, indeed for eternity. Source: Tavard, George H (1996). The Thousand Faces of Mary. Michael Glazier: Collegeville.